Covenanting with God is the swearing of an oath of fidelity to him. It is the act of subjects engaging in the most solemn manner to be true to their king. This was the import of the covenant entered into by the kingdom of Judah at the inauguration of Joash: “And Jehoiada made a covenant between the Lord, and the king and the people, that they should be the Lord’s people” (2 Kings 11:17). God’s right to men is not based on any conventional arrangement between him and them. It is original and absolute. “All souls are mine” (Ez. 18:4). “It is he that made us, and not we ourselves, we are his people“(Ps. 100:3). It is however their indispensable duty, as rational and moral creatures, to recognise that relation which by a divine constitution they sustain to their Creator; and to give all the security which he requires, that they will be his true and faithful subjects. It is perfectly reasonable—that intelligent beings governed by moral laws, should give their consent to that constitution under which Infinite Wisdom has placed them, and swear allegiance to the “Lord of the whole earth,” by whom it is administered. There is something analogous to this in the constitution of human governments. Nations usually require an oath of allegiance in order to citizenship. 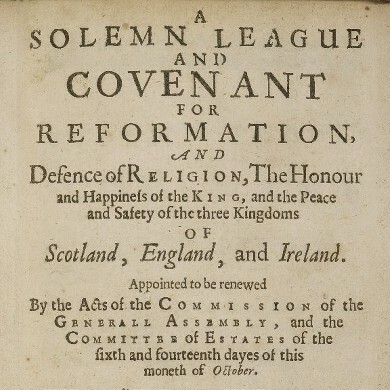 And though the principle has been wickedly misapplied, by requiring of men oaths of fidelity to governments that are not in a state of voluntary subjection to the Lord and his Anointed, yet the fact that they do so, demonstrates that men have naturally, some sense of the duty of covenanting. That what prevails not only among the Jews, but also among the Gentiles (following the light of right reason) is of common right. Thus the Greeks, Romans and others had their own laws in which are many things agreeing with the divine laws (which even a comparison of the Mosaic and Roman law alone, instituted by various persons, teaches). Institutes of Elenctic Theology, XI.xxvi.3. However, the New Testament duty of the nations to covenant with Christ does not flow from natural equity per se, but rather from the positive command of the New Covenant administration. Today magistrates have the duty to submit not only to Christ’s rule as He is the eternal Son, sustainer of all creation, but also to Him as Mediator, the risen Lord whom God is in the process of putting “all enemies under His feet” (1 Cor. 15:25; cf. Eph. 1:20-23). The nations are Christ’s “heritage” and obligated to “serve the Lord with fear” and to “kiss the Son” lest He “dash them to pieces like a potter’s vessel” (Ps. 2). “The wicked shall be turned into hell, and all the nations that forget God” (Ps. 9:17). “For the nation and kingdom that will not serve [the Church] shall perish; yea, those nations shall be utterly wasted.” (Is. 60:12). Is. 60:12 – He showeth that God hath given all power and authority here in earth for the use of his Church, and that they which will not serve and profit the same, shall be destroyed. Is. 60:13 – There is nothing so excellent which shall not serve the necessity of the Church. Is. 60:16 – Both high and low shall be ready to help and succor thee. Is. 60:17 – Thy governors shall love thee, and seek they wealth and prosperity. “At that time his voice shook the earth, but now he has promised, “Yet once more I will shake not only the earth but also the heavens.” This phrase, “Yet once more,” indicates the removal of things that are shaken—that is, things that have been made—in order that the things that cannot be shaken may remain. Therefore let us be grateful for receiving a kingdom that cannot be shaken, and thus let us offer to God acceptable worship, with reverence and awe, for our God is a consuming fire” (Heb. 12:26-29). A nation could not covenant and join themselves to Israel prior to the coming of the Messiah because the dividing wall had not yet been torn down (Eph. 2:16). But now, in the New Covenant, all authority has been given to Christ and His Church is to “make disciples of all nations” baptizing them and teaching them to obey God’s Law (Matt. 28:18-20). The nations that were once strangers and aliens are now to be grafted in to the covenant of grace and made “fellow citizens with the saints and members of the household of God” (Eph. 2:19). Nations now have a duty to subject themselves to Christ’s mediatorial kingdom (Ps. 22:28), establish the Church (Ps. 33:12), and covenant with God to further that kingdom as nursing fathers (Is. 49:23; 60:16). The authority which God has given Christ mediatorialy includes every nation of the world, and hence prior to His return every nation of the earth must have been brought under that authority by covenanting with Christ. Since we have not yet fully seen this in the course of history we expect a revival of religion and nations actually bowing the knee to Christ prior to His return as the Scriptures plainly indicate. He is made “heir of all things” (Heb. i. 2) as Mediator, for the heathen and all the ends of the earth are given him for an inheritance, Psal. ii. 8; but that is only church-wise; he shall have a catholic church fathered out of all nations, and all kings, and people, and tongues, and languages shall be made to serve him. George Gillespie, Aaron’s Rod Blossoming, pg. 94. To lay bands of promises and oaths upon a back-sliding heart, is commanded in the third Command, and is not Judaical, Gen. 14. 22. Gen. 28. 20. Psal. 132. 2. Psal. 76. 11. Its prophesied as a moral duty of Egypt converted under the New Testament, Isa. 19. 21. They shall vow a vow to the Lord, all the Gospel purposes and resolutions spoken to the Lord in praying, in suiting grace to do duties, confessing sins are so many Gospel vows laid upon the heart, to do such duties: nor is there a formal [ie. the words are not prescribed] swearing required in vows made to God. And this is sinful omission of a morally obliging duty, and morally obliging one man: so it obligeth a Nation, as affiirmative precepts do: and this smells of Anabaptism to cry down all Gospel-vows. A Survey of the Survey of that Summe of Church Discipline, pg. 482. Q. 60. What is a personal vow? Q. 61. What is a social vow? A. It is the joint concurrence of several individuals in the same exercise as in a personal one, openly avouching the Lord to be their God, Deut. 26:17; where Moses, speaking of all Israel, says, “Thou hast avouched the Lord this day to be thy God, to walk in his ways,” &c.
Q. 62. When doth such a social vow commonly get the name of a NATIONAL COVENANT? A. When the representatives of a nation, or the better part of them, concur in a covenant of duties, as ingrafted upon the covenant of grace, Jer. 50:4, 5 — “The children of Israel shall come, they and the children of Judah together, — saying, Come, and let us join ourselves to the Lord in a perpetual covenant that shall not be forgotten.” See also Neh. 9:33, and 10:1, 30. Q. 63. How do you prove that national covenanting is a warrantable duty under the New Testament? A. From its being promised in the Old Testament that this shall be a duty performed under the New, Isaiah 19:21 — “The Egyptians shall know the Lord in that day, and — they shall vow a vow unto the Lord, and shall perform it.” Besides, if it was a moral duty upon special occasions, under the Old Testament (as appears from 2 Chron 15:12, and 34:31, 32; Neh. 9:38), it must remain to be the same, upon the like occasions, still; because Christ came not to destroy the law or the prophets, but to fulfil them, Matt 5:17. Q. 64. Is our obligation to moral duties increased, by our vowing or engaging to perform them? A. Although it is impossible that our obligation to moral duty can he increased by any deed of ours, beyond what it is already by the law of God, which is of the highest authority; yet by reason of our own voluntary and superadded engagement, this obligation from the law may make a deeper impression than before, Psalm 44:17, 18, and our sins receive a higher aggravation, if we either omit the duty engaged to, or commit the evil opposite to it, Deut. 23:21, 22.